How has TeenSlim helped others? How do I use TeenSlim? It is in the spirit of helping to increase awareness of the relationship between diet, lifestyle and health that we offer the following information on teenage obesity. Please note that this information is offered for educational purposes only and is not intended to be a substitute for professional medical attention. When in doubt, please consult your health practitioner. In many developed countries, teenage obesity is reaching epidemic proportions and, according to the Centers for Disease Control and Prevention, about 15% of children and teenagers aged 6-19 years are overweight compared to just 5% in the 1960s. In addition a further 15% are at risk of becoming overweight. Teenage obesity has an adverse effect not only the present health status of teenagers, but also on their psycho-social development and future adult health status. Obese teenagers usually go on to become obese adults with all the associated health problems such as high blood pressure, high cholesterol, diabetes, respiratory problems, strokes, etc. One very worrying factor is the increase in the number of young people, including teenagers, who are developing these lifestyle related diseases. From a psychological point of view the adolescent years are tumultuous times with body image and peer pressure becoming increasingly important factors. An overweight teenager may feel depressed from being teased or being “unpopular” and can therefore develop a negative body image and low self esteem. The unhappiness and stress experienced can in turn lead to further compensatory habits such as comfort eating and consequential purging and so the vicious cycle continues. Negative feelings can develop and they often withdraw from school and sporting activities, leading to further psychological stress… all in all a vicious cycle that needs to be broken. Feeling good and staying healthy are the most important components in maintaining healthy body weight. Rather than resorting to crash diets and punishing exercise routines, alternating with binging and self blame, remember that it is never too late to make lifestyle changes. With the correct support and guidance, these changes are often not as big as you would think! Obesity in adolescents is caused by several factors - mostly similar to those for obesity in adults. While there is sometimes a genetic predisposition to obesity, by far the most important factors contributing to teenage obesity are lifestyle related. A lack of regular physical activity or exercise is common amongst today’s youngsters as sedentary leisure activities like watching TV and using computers abound. As teenagers start developing a greater interest in socializing, sporting activities often fall by the way side. Encouraging teenagers to keep up with their sports and organising family outings involving exercise can all help. Try and find activities that teenagers enjoy, e.g. dancing, martial arts or horse riding. Eating habits have become less healthy, with an increase in the amount of junk food and ready prepared or convenience meals being consumed. These tend to be high-calorie foods with low nutritional value. Portion size has also increased dramatically in the last decade or two as has the development of poor eating habits (e.g. eating in front of the TV). The combination of declining exercise and increase in bad eating patterns is largely responsible for the increase in obesity in young people. However, with small and relatively simple steps, it can be addressed. As these patterns and trends are started right from childhood, it is important to address them, as a family, right from the beginning. Obese children usually become obese teenagers and adults. Like most things, prevention is usually better than cure, but this does not mean that adolescent obesity cannot be easily addressed. Essentially, people gain weight when they take in more calories than they burn up. This means that it is important to address both of these areas – exercise or physical activity as well as diet. One of the best ways to prevent obesity in teenagers is to encourage healthy eating habits and a positive approach to physical exercise right from early childhood. Children model themselves on their parents and setting a good example at home, right from the start, is the simplest and most effective way to set them on the path to natural, healthy long-term weight control. Most teenagers are naturally conscious about their bodies. There is also a great deal of pressure on teens to conform to media standards of 'beauty' in order to look good and be accepted by their peers. At the same time, the temptation to snack on readily available junk food is difficult to resist in modern society. For this reason, many teens are always on one diet or another in order to loose weight. Yo-yo dieting and complexes about weight can make teenagers vulnerable to eating disorders and also set up patterns of behaviour that will not be healthy in the future. It is important to help teenagers learn how to follow a healthy diet and, if they are overweight, to help them to loose weight in a healthy manner - without compromising their growing bodies, reproductive systems and self esteem. 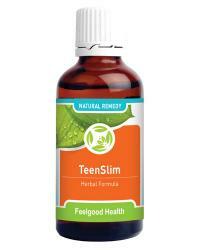 TeenSlim is a complex herbal remedy, especially developed for teenagers by a Clinical Psychologist. TeenSlim is formulated to assist with weight loss and prevention of weight gain in adolescents, as well as to cleanse the system, thereby preventing acne breakouts and boosting energy levels. Combined with a healthy lifestyle and diet, TeenSlim will prevent weight gain without compromising healthy growth in adolescents. For the overweight teenager, TeenSlim will also help to ensure healthy liver functioning and breakdown of dietary fat, healthy metabolism and healthy digestion, thereby assisting in the overall weightloss plan. Like all Feelgood Health products, TeenSlim is developed with care by our practising Clinical Psychologist, is 100% natural and manufactured according to the highest pharmaceutical standards. Individual ingredients are well-researched and have been specially chosen for their high safety profile in adolescents’ remedies. Foeniculum vulgare (Fennel) Fennel has been used since ancient times as a natural appetite suppressant and was traditionally used to prevent 'growling stomachs' during church services. Fennel also promotes the functioning of the liver, kidneys and spleen, thereby ensuring the healthy processing and elimination of dietary fat. Garcinia cambogia This herbal ingredient works in a number of key ways to assist with weight loss. It reduces the storage of fats from the diet and increases metabolism. In addition, Garcinia Cambogia also acts as a natural appetite suppressant. One of the principle active ingredients in Garcinia is Hydrocitric acid (H.C.A.). Research, reported in the American Journal of Clinical Nutrition, has suggested that H.C.A. is instrumental in burning body fat without causing loss of body protein or lean mass. H.C.A. has also been shown to block the synthesis of fat, thereby causing the body to burn more calories. Guggel This plant has been used for centuries in Ayurvedic medicine to treat a number of disorders, most notably as a weight reducing agent. It also assists with normalising blood cholesterol levels by lowering the “bad” cholesterol and raising the “good” cholesterol as well as acting as an anti-oxidant. Fucus vesiculosis: Also known as Bladderwrack or Kelp, this is an excellent source of minerals, especially iodine, which is a vital thyroid nutrient and component of the thyroid hormones. The thyroid gland is an important regulator of metabolism and weight and a healthy thyroid will mean a healthy metabolism. In addition Kelp is rich in trace minerals, important for overall good health, as well as promoting a healthy immune system. Arctium lappa (Burdock root) Burdock has been used for centuries for a variety of reasons, a testimony to its popularity being the fact that it is mentioned in a number of Shakespeare’s plays. While previously used mainly for its blood cleansing and purifying function and support of the organs of elimination (liver, kidney, bowels), it has also been shown to moderate blood sugar levels, assist with carbohydrate metabolism and to aid the pituitary gland with the regulation of hormones and body weight. Because of its cleansing and detoxifying abilities it is able to assist the body to maintain a healthy skin and prevent acne. Cleavers (Gallium aperine) Cleavers is one of the most well known tonics available to assist the lymphatic system with the clearing of waste and toxins and is an excellent detoxifying agent. For this reason, Cleavers has a positive effect on the skin and will assist in the prevention of pimples and acne so common in the teenage years. Eleutherococcus senticosis (Siberian ginseng) As a known “adaptogen”, Siberian Ginseng is able to assist the body to adapt to any situation, thereby helping the system to return to and to maintain a healthy balance. The teenage years can be extremely stressful, particularly so if maintaining a healthy weight is difficult. Regular use of Eleutherococcus can help to relieve fatigue, increase energy and concentration and promote an all-round sense of well being. An additional benefit is Siberian Ginseng’s ability to strengthen the immune system. Gymnema sylvestre An important herb in both Ayurvedic medicine and Traditional African medicine, Gymnema is known to regulate and lower blood sugar levels, decrease absorption of dietary fats and help to prevent weight gain. It also assists the body with overall metabolic control as well as in lowering cholesterol levels. In addition the leaves have the effect of being able to block the ability of the tongue to taste sweet substances, thereby decreasing the desire for foods with a high sugar level. This property has earned Gymnema the nickname 'the sugar killer'! TeenSlim contains less than 1% pure pharmaceutical ethanol when diluted as directed. Directions: Use 10 - 15 drops in approx. 1/4 glass water or juice three times daily. You can also add the drops to your bottled water. Caution: Safety during pregnancy and nursing has not been established. Regular use will show a gradual loss of weight and improvement in the skin’s condition within 3-6 weeks. An increase in energy levels and overall sense of wellbeing will also be noted. For optimum results, combine with regular physical activity and a healthy balanced diet. One 50 ml bottle will last approximately 30 days. A 120-day supply (see the Buy 3 Get 1 FREE special) would be four bottles. Get the whole family involved in physical activities that everyone enjoys like walking, bicycling or rollerblading. Get other families in your neighbourhood involved in group activities or games like basketball, tag or touch-football. Make each member of your family responsible for different active chores like mowing the lawn, washing the cars or vacuuming. Encourage participation in organised sports or activities like dancing, tennis, martial arts, etc. Limit sedentary activities, especially computer games and TV. Try the little things – use the stairs instead of the elevator, park just a little further away and walk the remaining distance, cycle instead of driving if not going too far. Plan meals in advance to make shopping easier and get the whole family involved in preparation. This will reduce time needed for preparing healthy meals and will teach children and teenagers about healthy cooking methods and food preparation. Allow enough time for meals, as eating in a hurry is bad for proper digestion and does not allow a feeling of fullness to develop. Avoid other activities during mealtimes such as watching TV. Pay attention to portion size – don’t supersize! Have snack foods available that are low-calorie and nutritious like fruit and vegetables cut into convenient snack-sizes or small cartons of yoghurt. Serve smaller portions but allow for second helpings after a short wait. Limit fast-food and junk food to no more than once a week. Eat regularly – teenagers need nutrients as they are still growing, so starving doesn’t help! Avoid quick-fix diets and “binge and purge” diets – they do not work and are detrimental in the long run. Slow, continuous weight loss is the best way to realising and maintaining an optimum weight. Let your child know that he or she is loved and appreciated whatever his or her weight. An overweight teen probably knows better than anyone else that he or she has a weight problem. Overweight teenagers need support, acceptance and encouragement from their parents. Focus on your teen's health and positive qualities, not their weight. Try not to make teens feel different or inadequate if they are overweight. Rather focus on gradually changing your family's physical activity and eating habits. Be a good role model for your children. If they see you enjoying healthy foods and physical activity, they are more likely to do the same now and for the rest of their life. Realize that an appropriate goal for many overweight teenagers is to maintain their current weight while growing normally in height.